Casters on Base Lock in Place for Safety. 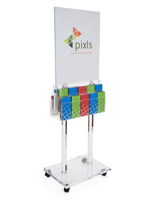 Durable Acrylic Construction for Busy Areas. 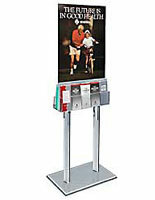 Adjustable Dividers for 4" Brochures or 8.5" Leaflets. 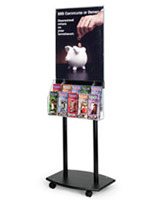 This 10-pocket mobile literature display is designed as a double-sided poster holder in addition to the 5 pamphlet slots on each side of the holder. 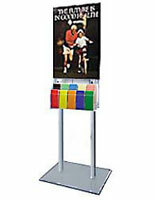 The public information exhibit is made of acrylic and will hold up well in areas of heavy traffic. 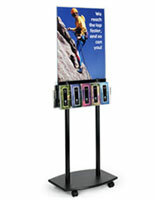 The literature display with adjustable dividers is able to store 4” wide brochures as well as 8.5” leaflets. 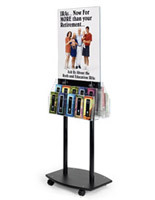 The clear acrylic poster holder will showcase 22” x 28” prints for the ability to see information at a distance. 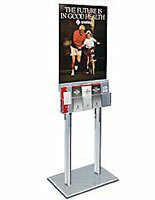 The display has 4 casters that lock so it can safely be placed in public locations. 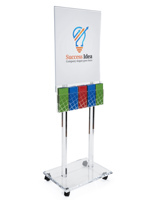 The 67” tall rolling stand needs some assembly and uses hardware that is provided with purchase.